On 23 January, the eMAGIC consortium met at the CIDETEC headquarters in Donostia-San Sebastián. This international initiative is aimed at placing Europe at the forefront of the development and industrial application of a new battery technology based on magnesium. Today, lithium ion batteries are the leading technology for all types of energy storage applications: electromobility, portable electronics, stationary applications and others. It is a living, evolving technology, yet there are certain limits on energy density, durability, cost and environmental impact that need to be taken into consideration. Moreover, Europe is well known for its dependence on other regions, particularly Asia, which account for most of its productive capabilities. Magnesium (Mg) is a relatively abundant metal (3000 times more so than lithium), recyclable and accessible. Batteries with magnesium anodes have the potential of a volumetric energy density much higher than lithium-ion batteries (above 1000 Wh/l) and represent a clear commitment to the future in the energy storage sector for all types of applications. Nevertheless, Mg batteries, described in scientific literature some years ago, have been limited due to the absence of a suitable electrolyte that allows cyclability commensurate with the required performance. Other challenges relate to identifying the most appropriate cathodic materials, as well as the use of Mg alloys with other metals in the anode. 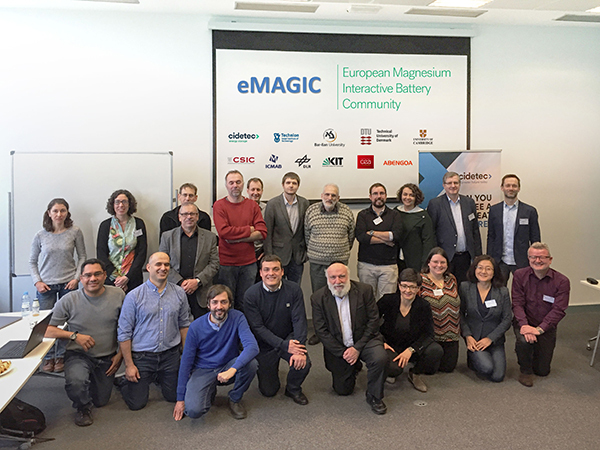 The eMAGIC consortium, coordinated by CIDETEC Energy Storage, brings together the leading international pioneers in Magnesium battery research. eMAGIC includes ten partners from six countries (Germany, Denmark, Spain, France, Israel and the United Kingdom), covering a complete value chain ranging from fundamental research to industrial feasibility analysis, as well as technological development, prototyping, modelling and other aspects. The ultimate objective of the project is twofold: on the one hand, to develop magnesium battery technology until its industrial viability is proven; on the other hand, to pave the way for the establishment of a foundational international community for the generation of cutting-edge knowledge, providing Europe with technological independence and international leadership in the field of future battery technology. eMAGIC has a budget of €6.7M for a four year period, and is funded by the European Commission's H2020 programme under the FET Proactive 2018-2019 invitation to submit proposals for "Disruptive micro-energy and storage technologies", having obtained the highest mark (15 out of 15) in the independent evaluation process.